There are so many ways to experience the Los Angeles River! There are walking and bicycling paths, pocket parks, seasonal boating and other activities that you can enjoy on your own or as part of an organized event. From the Sepulveda Basin Wildlife Reserve in the San Fernando Valley, to Griffith Park and the Seasonal Recreation Zone in the Glendale Narrows, and many of the historic bridges downtown, the Los Angeles River continually offers new ways to appreciate the River and surrounding communities. If you want to walk, bike, kayak, picnic, bird watch, fish, horseback ride or just better understand the Los Angeles region, there are countless ways to do so! Enjoying the river means enjoying your city, your community, as well as the natural and built environment in ways that we hope will inspire you to care for and steward this amazing public resource. Whether you have been coming to the river for years or are new to its banks, the Los Angeles River is sure to offer many surprises. It is ever changing with artwork, history, culture, seasonal dry and wet weather, as well as amazing flora and fauna that are sure to renew your sense of wonder and excitement about its continued possibilities for revitalization and restoration. 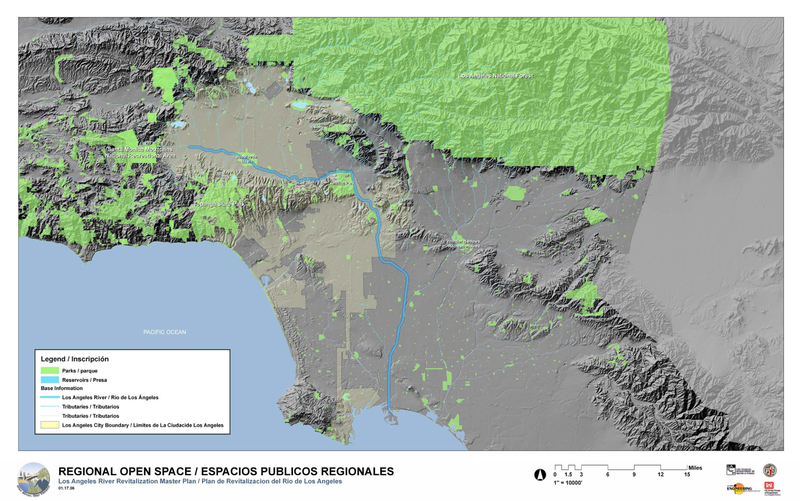 Cities all over the world are reclaiming their rivers and Los Angeles is no exception. 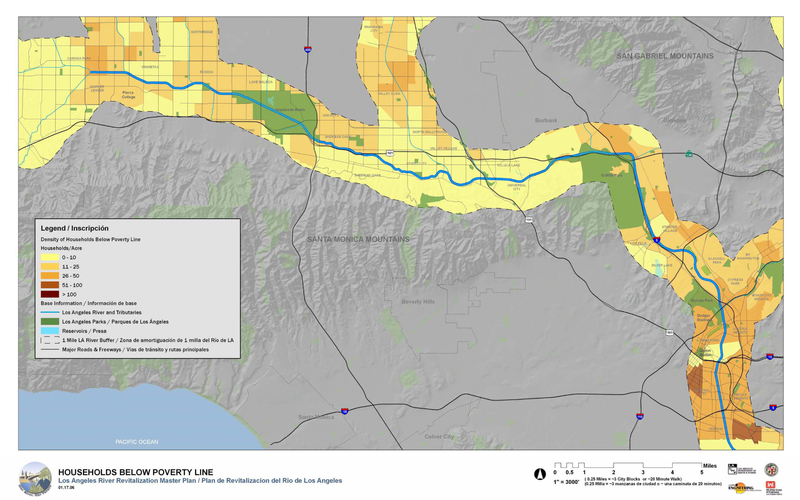 We hope you will find this ‘Visit the LA River’ section useful and feel free to write us with ideas and observations of your own as you explore the mighty Los Angeles River. Or send us your photos and we may use them to build our interactive maps! The Los Angeles River offers a variety of trails for pedestrians, bicyclists, and equestrians. 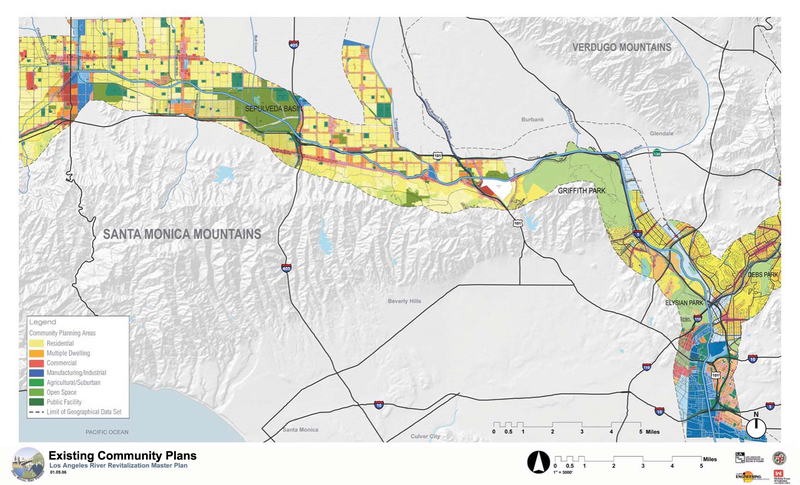 The vision is for continuous and uninterrupted movement along the LA River which would connect neighborhoods to the River, and create an interconnected network of parks and greenway from the mountains to the sea. 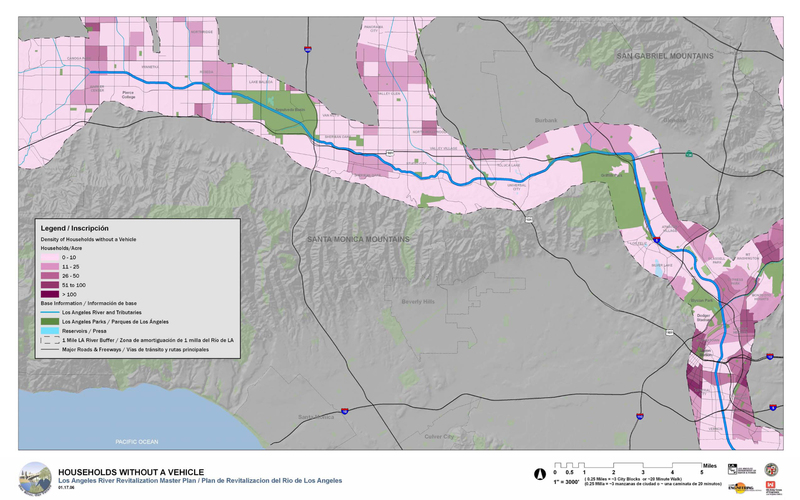 There is access to many sections of the LA River, but not all, so it is advised to plan ahead using our interactive "LA River Greenway” map below . Click on each greenway segment for photos and information regarding the different access points, parking, and transit options. Excellent starting points to experience different sections of the River include: Sepulveda Basin, Griffith Park, the City of Glendale Riverwalk, and the Long Beach bike path. 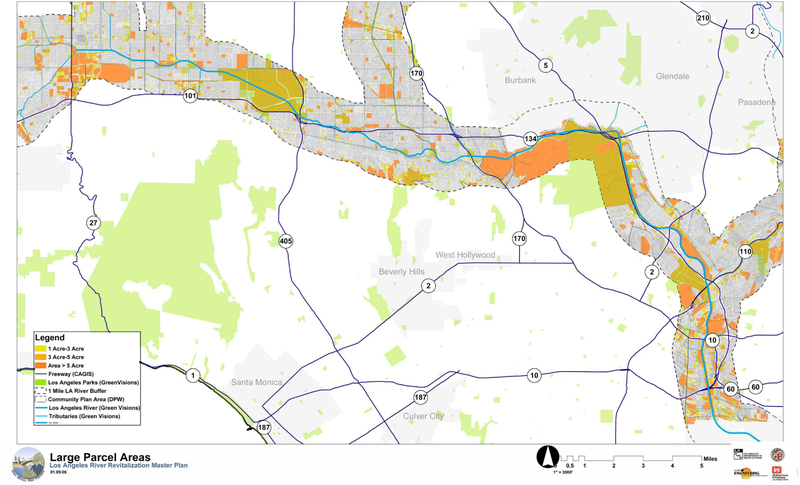 NOTE: brown = river trail, green = bike-friendly river trail. 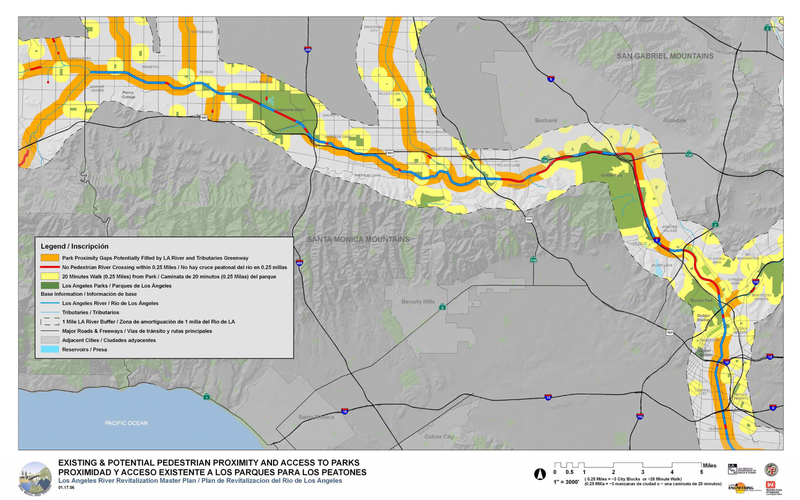 Any trail project along the LA River is part of the National Park Service's Juan Bautista de Anza National Historic Trail. The places to visit along the way are as diverse as the communities that surround the River. 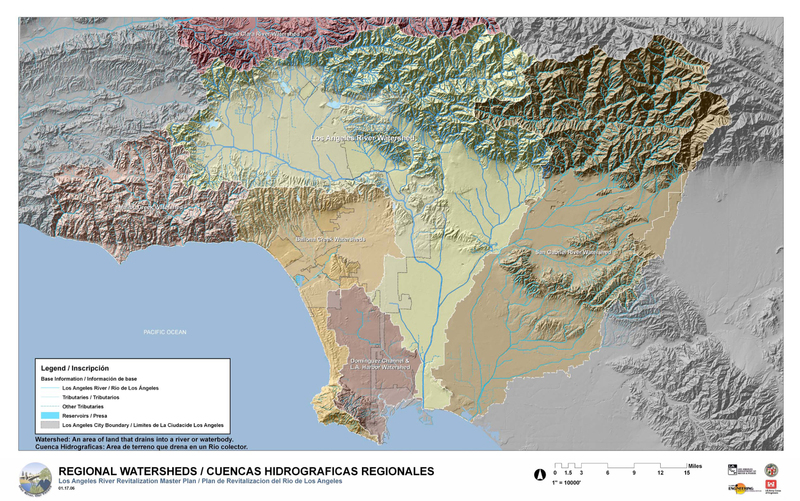 In the City of Los Angeles, the stretches of river can roughly be divided into the Valley, Glendale Narrows, and downtown portions of the river. 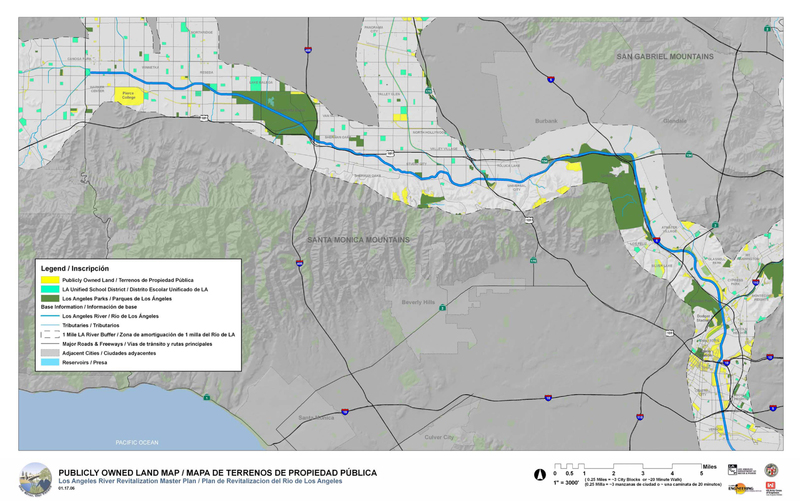 Learn more about these sections of the river below or go to a specific area of interest by using the "Visit the LA River" interactive map above. In 225 acre Sepulveda Basin Wildlife Reserve there are walking and biking paths, kayaking from Memorial Day to Labor Day, bird watching and a number of facilities such as the Japanese Garden, the golf course, picnic areas, and Lake Balboa. WALKS to view and study more than 200 different species of birds seen in the wildlife reserve are conducted by the San Fernando Valley (SFV) Audubon Society. There's a Bird Walk on the first Sunday of every month from 8am-11:30 am, year-round. For families & beginners, there's a Bird Walk on the second Saturday of winter months between October and March starting at 8:30 A.M.and ending around 11:00 A.M.
GROUP HIKES & CLEAN-UPS are sponsored by environmental organizations including the California Native Plant Society, SFV Audubon, The River Project and Sierra Club. The wildlife reserve serves as an outdoor classroom for EDUCATIONAL FIELD TRIPS for local school, sponsored by SFV Audubon. INVOLVEMENT to track the migrating Canada Geese and promote habitat conservation originates through the Canada Goose Project. You can participate in the Goose Count from October through March on the following schedule: Sat. 3-6pm, Sun. 5:30am-8am, Tues. 3pm-6pm, Wed 5:30am-8am. ADOPTION of habitat areas by volunteers including "Hummingbird Hill" and other projects (weeding, new planting, maintenance) are organized through the Sepulveda Basin Wildlife Areas Steering Committee. Accessible by car, transit, or bicycle, the Sepulveda Recreation Area is located just west of the Sepulveda Dam off the 101 freeway or the Orange Line Busway and dedicated bikeway. If traveling by bicycle or walking there is a loop around the basin that is scenic and accessible for all abilities. 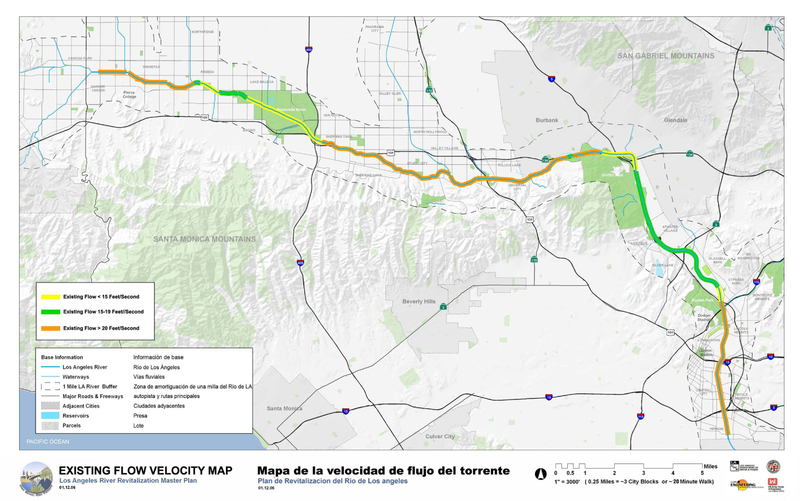 If you would like to continue by bicycle west of the Recreation Area you will need to take surface streets until you reach the West Valley bikeway, which goes from Mason Avenue to Vanalden and also connects to the new Headwaters Greenway where the Los Angeles River begins at the confluence of Bell and Calabasas Creeks. There are various access points from the street along the way as well as places to stop adjacent to the River such as Reseda Park. East of the Recreation Area, you’ll want to take surface streets past the Sepulveda Dam and 405 freeway until you reach the LA Riverfront Park and the various other stretches of greenway through Sherman Oaks and Studio City including Ernie’s Walk, the Village Gardener’s Greenway and Valleyheart Greenway. In the Glendale Narrows the River bends around Griffith Park and begins to run north-south instead of east-west as it does in the San Fernando Valley. 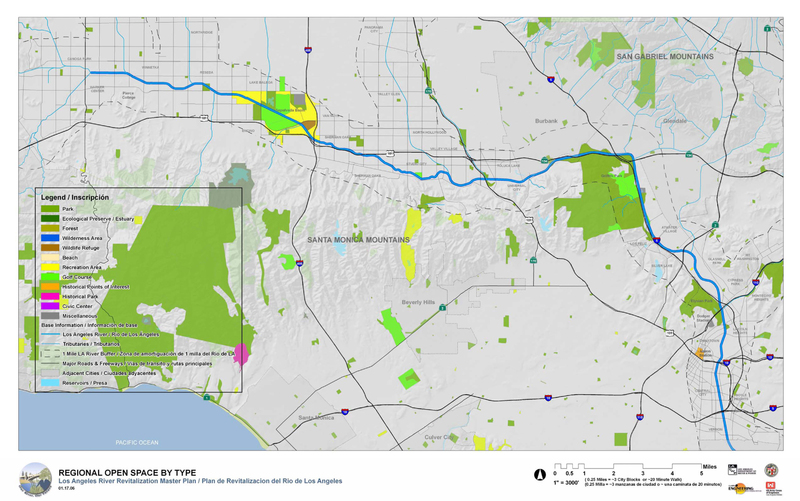 In addition to being one of the largest municipal parks in North America, Griffith Park also has several great access points to the Los Angeles River at Bette Davis Picnic Area, Ferraro Fields, and from the Autry Museum and Los Angeles Zoo. EQUESTRIAN. At the northwest end of the park are recreation areas, equestrian trails, and equestrian facilities including private boarding as well as horse rental and guided trips. The LA River BIKEPATH begins at the historic Riverside/Zoo Drive Bridge where it bends south at Ferraro Soccer fields and continues for 10 miles through the soft-bottom portion of the River channel known as the Glendale Narrows. There is PARKING in this area of Griffith Park and limited access to the opposite (north) river bank where the cities of Burbank and Glendale have also completed riverfront improvements. Bicycle rental is also available in Griffith Park. As you follow the bikeway south through Atwater and Elysian Valley there are numerous pocket PARKS along the way as well as the RECREATION ZONE for boating and fishing beginning at Fletcher and continuing to Egret Park. Elysian Valley is primarily a residential community and parking is limited, however there is a small lot at Marsh Park or street parking. Or consider parking at the Los Angeles River Center and Gardens. Here the bikeway ends and follows city streets through Lincoln Heights, Downtown LA and Boyle Heights until it begins again in the City of Vernon. Another great place to begin your exploration is at the Los Angeles River Center and Gardens. This former Lawry’s restaurant has been converted into a visitor center and community space. The Mountains Recreation and Conservation Authority, who also manages the River’s Recreation Zone, manages the Center. 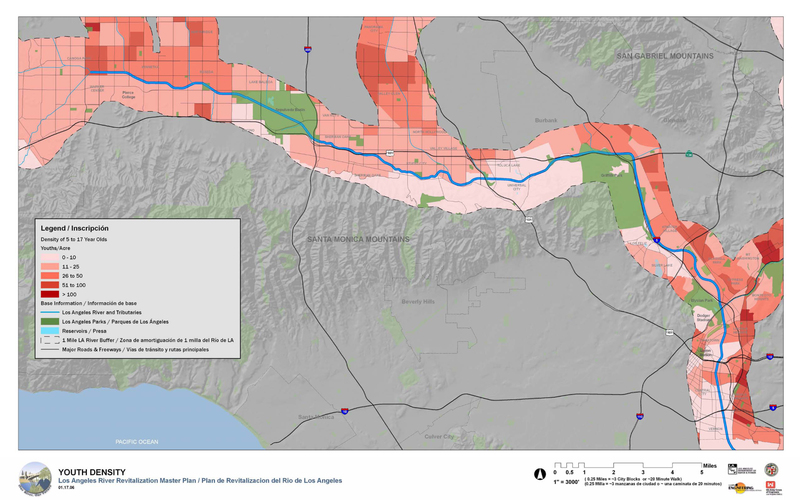 It is home to the offices of many nonprofits that are working to revitalize the Los Angeles River. With plenty of parking as well a bicycle facility, the Center offers interpretive information about the River and is a short distance to the Arroyo Seco Confluence as well as the downtown sections of the River. 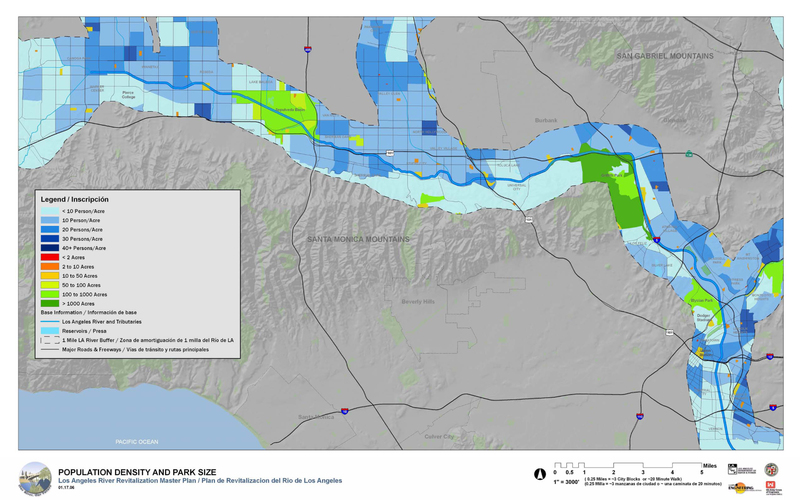 Access to the River in Downtown Los Angeles is limited due to the rail lines on both sides of the River. However many of the iconic bridges over the River are located in this stretch and the City of LA was founded on the banks of the River near present day Olvera Street and El Pueblo de Los Angeles. When it reopens in 2015 Los Angeles State Historic Park is a great place to begin your visit. The north end of the park is situated between the historic North Broadway and Spring Street Bridges and the long-term vision is to connect the park to the River in this location. There will be a Visitor’s Center at the south end of the park near Chinatown that explores the history of the area including the Los Angeles River. Accessible by bicycle and transit you can continue south past El Pueblo, Placita Olvera, and Union Station into the Arts District where the remaining downtown bridges cross the River from First Street to Washington Boulevard. The strong statement of linking nature to our built environment along the LA River is achieved by the remarkable variety of iconic bridges that span the River. With an amazing selection of historic bridges there is an experience for everyone whether you're interested in architecture or using the bridges for transportation between communities. 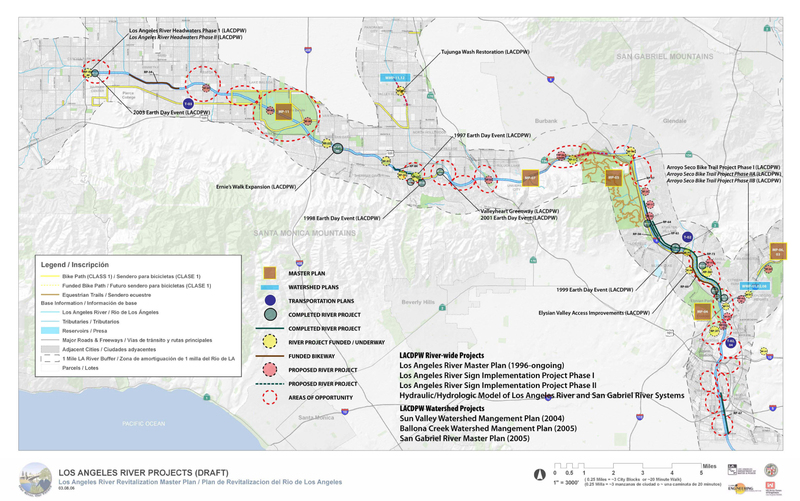 South of downtown Los Angeles the LA River Bikeway begins again in Vernon at Atlantic Blvd. and continues almost 18 miles to the City of Long Beach. The Metro Blue Line train is nearby the River path in Long Beach with stations accessible by street throughout this stretch of the River. 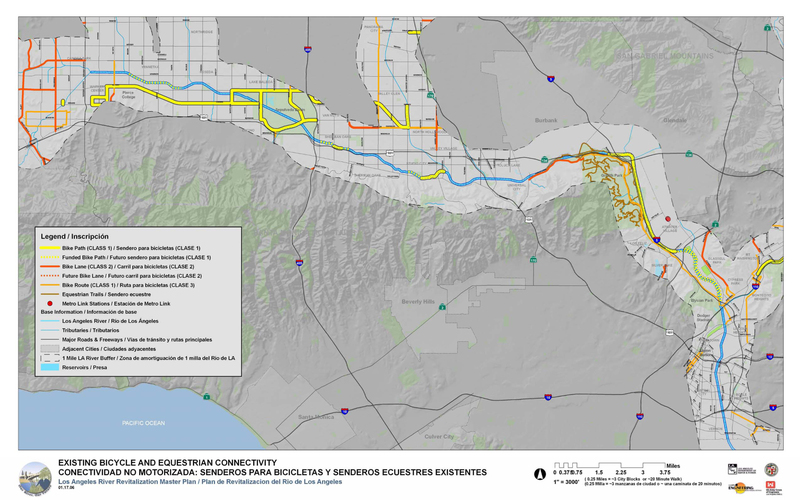 The bikepath switches from the west to the east side of the River at the Confluence of the Rio Hondo, which also contains bikeways that lead toward Whittier Narrows and the San Gabriel River. Roughly following the 710 freeway, the LA River bikepath passes through River adjacent parks in Maywood, Southgate, and Paramount before reaching the estuary and mouth of the River as well Shoreline Drive with its many attractions in Long Beach. 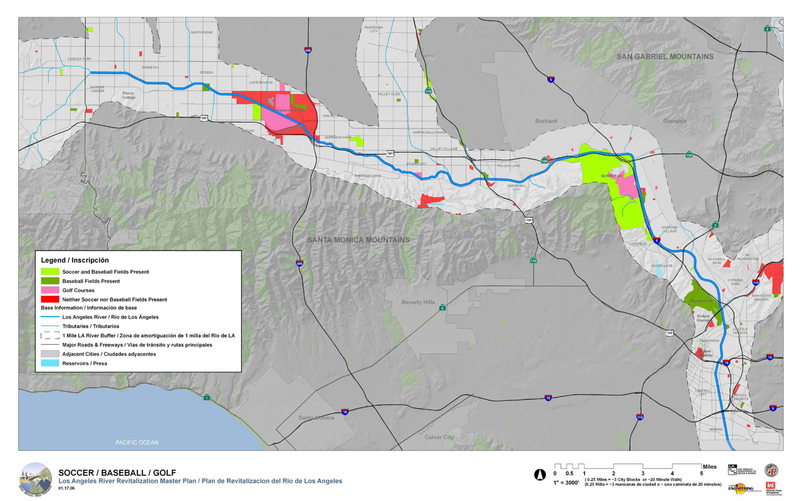 The Los Angeles River continues to receive attention and resources to increase revitalization efforts. Future projects will improve connectivity and further enhance your experience of the River. For more information visit our Projects page and check back often for changes and updates. Please share with us your favorite ways to enjoy the mighty LA River! 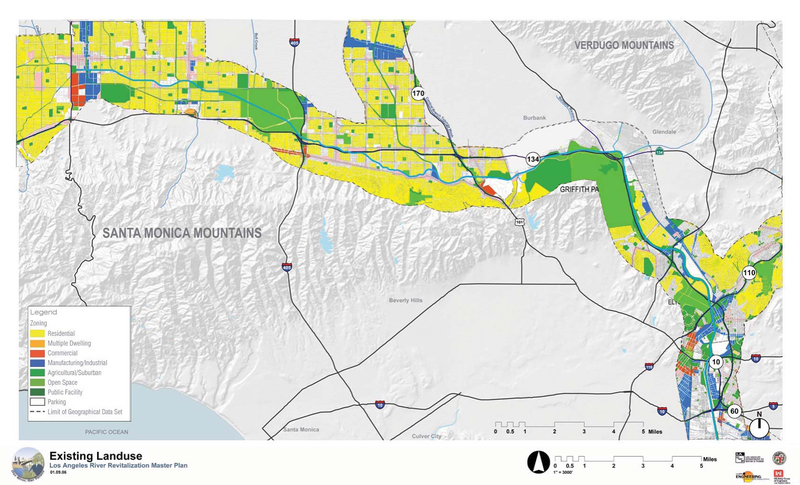 The Los Angeles River Revitalization brochure--partially pictured above--is a 2-sided panel measuring 36" x 10" that folds into a handy 6" x 10" document. The brochure may be viewed or downloaded online. Organized groups that would like to conduct an event, program, or provide services in the recreation zone need to obtain a permit from the Mountains Recreation Conservation Authority (MRCA), and provide proof of liability insurance. There is no need for a permit and there are no user fees for individuals entering the Pilot Recreation Zone.